Tupu King — "Te Heke"
For those who like a challenge, we have invited some elite paddlers such as Tupuria King will be a member of a two man team, the other paddler being a man of his choice. Tupu King is the undisputed champion of Waka Ama in New Zealand presently, and has had this title for over 3 years. 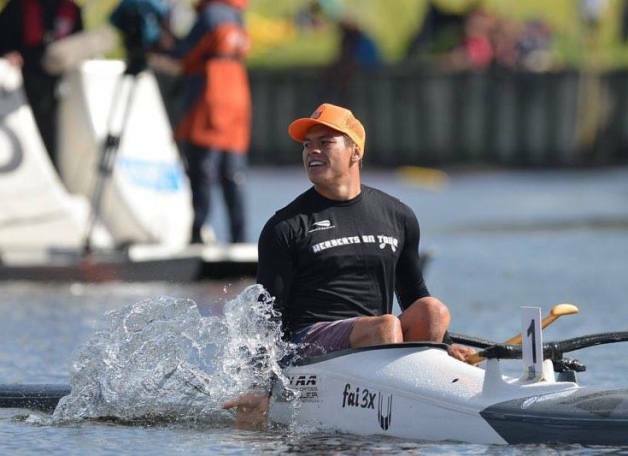 He excels in both short distance (500m) and long distance (28km) and has a huge following in the Waka Ama community. Additionally his presence is large on social media with over 4000 facebook friends and instagram followers. Tupu King will race "The Heke" with another elite paddler of his choice. If any other team (first placegetters in their category) beat Tupu's 2 man team around the Island, they will receive a cash prize. The 2 man V1 will receive $600, 3 man $400 and 4 man team will receive $200. A successful OC1 2 man team will also receive $300. Give it your best shot fellow paddlers, however this fellow and his chosen teammate are not going to lie down for you. who’ll be doing it solo.